Dry weather is set to continue over most parts of TN except extreme south and ghats sections of interior TN. Heavy to very heavy rains very likely over isolated parts of Kerala, north coastal AP, Coastal and south interior Karnataka. Extremely heavy rain likely over isolated parts of north east India. The Southwest Monsoon has further advanced into some more parts of Odisha and Gangetic West Bengal, remaining parts of North west Bay of Bengal, entire Arunachal Pradesh and most parts of Assam, Meghalaya and Sikkim. The Northern limit of Monsoon (NLM) passes through Lat. 19°N / Long. 60°E, Lat 19°N/ Long. 70°E, Thane (including Mumbai), Ahmednagar, Buldhana, Amraoti, Gondla, Titalagarh, Cuttack, Midnapore, Lat. 24°N/ Long. 89°E, Goalpara, Baghdogra and Lat. 27°N/ Long. 87°E. 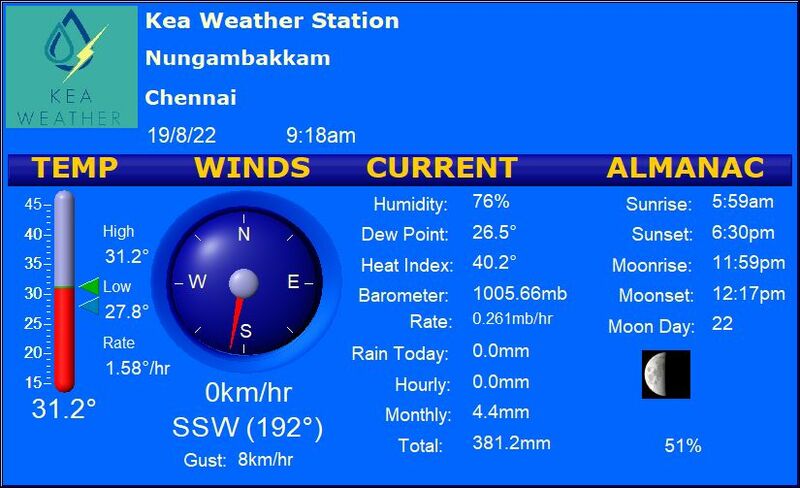 Chennai – Warm with a high of 37 degrees and an uncomfortable night with a low of about 29 degrees. Vellore – Breezy with a high of about 36 degrees and a low of about 27 degrees. Madurai – Partly cloudy with a high of about 37 degrees and a low of about 27 degrees. Trichy – Drafty with a high of about 37 degrees and a low of about 28 degrees. Coimbatore – Breezy and cloudy. High of about 33 degrees and a low of about 24 degrees.